If a visit to the island of Bali, is incomplete if it did not bring a gift when back home. In Bali there is a very suitable place for shopping, the Ubud Art Market. In Ubud Art Market is open every day. 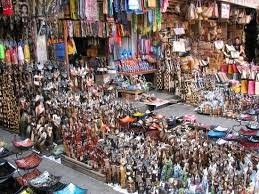 In this market you can find various crafts suitable for souvenirs, such as various kinds of silver, silk scarves, handmade woven handbags, hats, sculptures, and various other handicrafts. Items made of silver sold at a price range starting from Rp. 500000 to USD 1000000. Interestingly, the silver is produced solely by the local traditional silversmiths. Most of the items contained in Ubud Art Market is handmade from residents of neighboring villages such as, Pengosekan, Tegallalang, Seminyak and Peliatan. Ubud Art Market is not only visited by local tourists, as well as by foreign tourists. They rollicking visit Ubud Art Market. The market has become one part of the attractions in Bali.